The Quaker Council for European Affairs are concerned about the harm experienced by refugees travelling to and within Europe. We are calling for safe and legal ways for refugees to travel to Europe and for peacebuilding approaches to be used to end the violence that many refugees have escaped. We are opposed to ‘fortress Europe’ and military responses to migration. Please scroll through this page to read about some of our work. 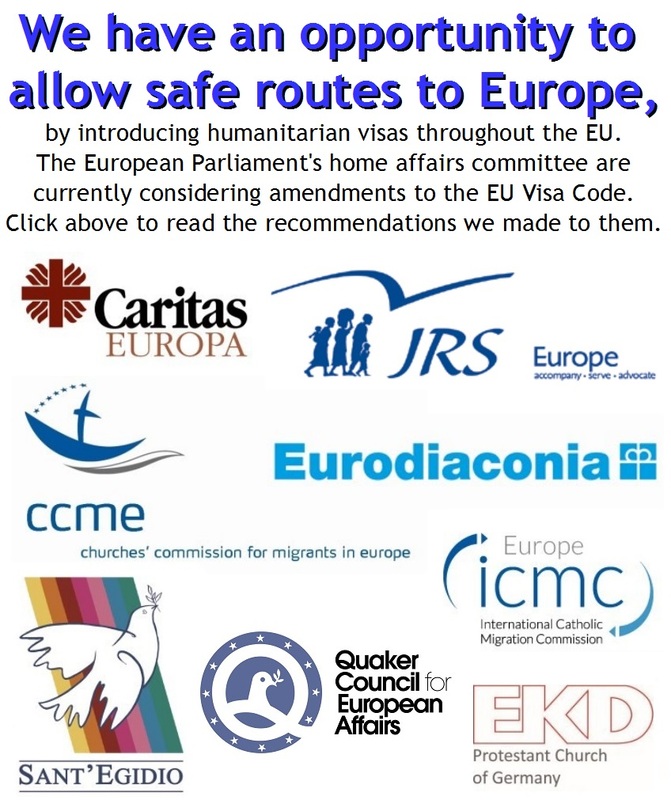 A letter to MEPs about Humanitarian Visas from eight Christian organisations, including QCEA (15 September 2015). Click here tread. We CAN choose loving and effective responses (4 September). Click here to read more. For more on the EU’s military response (15 August), Click here. Quakers in Britain call for safe paths for refugees (5 September). Click here to read more. To find out about specific recommendations for safe and legal paths to the EU (November 2014), click here. Resources: Community Welcome Plan – Each Local Refugee Welcome Committee (Local Committee) will need to create their own Community Welcome Plan. This document sets out what you aim to do to welcome refugees and is the basis for relating to the local council and the National Refugee Welcome Board (National Board). Its purpose is to help ensure resettled refugees are properly welcomed, and that host communities have a positive experience of resettlement. I expect you know about the Immigration Bill currently going through Parliament. If it becomes law, this Bill will make it a whole lot harder to welcome those seeking sanctuary, as Migrant Rights Network makes clear in this briefing. We have prepared sample letters for you to use, but make sure you adapt them and please use your own words as far as possible. Personal letters are more much more effective than duplicate mailouts, and some Peers delete any emails that are identical to others they have received.